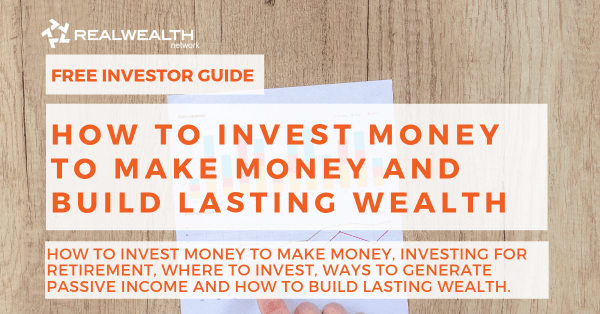 Summary: In this article, you will learn how to invest money to make money. Topics include investing for retirement, how and where to invest for short-term and long-term goals, ways to generate passive income and how to build lasting wealth. Investing your money can be one of the best ways to save for retirement and build lasting wealth for you and your family. But now-a-days, we’re facing some new problems that are making it very hard for people to retire at 65 or at all. One of those issues is that people are now outliving their money. With life expectancy now past 80 years old, pension plans and social security are simply not set up to last long-term. In fact, many companies no longer offer pensions and by the time you and I are ready to retire, social security probably won’t be around either. Another major reason people can no longer afford to retire when the time comes is inflation. The cost of living continues to grow and every year it becomes more expensive to do even the most basic things. What worked 20 years ago, doesn’t work now. Every investment strategy is as unique as the investor. How and where you choose to invest your money depends on your age, current financial situation and goals for the future. All investments should be based around your short and long-term financial goals. There’s a big difference between making money through investments and building lasting wealth. You will know you’ve built lasting wealth when you no longer need to work, but you still have enough to live comfortably – and ideally you are generating passive income every month. We’ll talk about just how to build lasting wealth later in the article. Short-term goals could be saving for a down payment on a house you plan to buy next year, an emergency fund, or a vacation in the somewhat near future. Long-term money goals could be saving for retirement, a down payment for a house, college tuition for your kids, a second home or a big international trip years down the road. The goal of short-term investing is to make as much money as possible, as quickly as possible. While this may sound great, short-term investments are risky because they always count on two factors: timing and luck. First, you need to get into the market at the right time and then get out before it falls apart. Second, you need to be lucky enough to find an opportunity to buy an investment asset that will quickly rise in value and stay valuable in a few months or years. All markets work the same way, meaning they fluctuate up and down. If there’s one thing investors can count on, it’s fluctuating markets. This is why a short-term investment strategy is extremely risky. Most finance experts will tell you to save money for short term goals rather than invest. Keeping this in mind, there are some less-risky options available for short term savings and investing that we’ll cover next. High-Yield savings accounts keep your money safe and available to withdraw at any time. Online banks like Goldman Sachs and Barclays offer interest rates as high as 1.85 percent on cash savings accounts. As these savings accounts are insured by the FDIC, they are safe from any loss. CDs or Certificates of Deposit, earn slightly higher interest than a savings account. The catch with CDs is that the best rates usually require an agreement that will make your money unavailable for a year or more. If you want to keep some of your cash liquid, consider setting up CD ladders, which allows you to choose CDs with different maturity dates. The interest rates on money market accounts are similar to CDs, but come with fewer restrictions. A common restriction is a limit on how many withdrawals you are allowed to make every month. When you buy investment bonds, you are basically loaning money to a company or the government (you can also buy foreign bonds). You will then earn interest over the lifetime of the loan or bond. If the timeframe to access your money is beyond 18 months, your risk will be even lower. Keep in mind that these types of investments only produce a 2 to 4 percent return, on average. Fixed-income funds are similar to bonds, offering a better return than savings accounts, with relatively low risk. These funds are designed to minimize risk and losses if the market takes a downturn. Structured Notes can have interest rates as high as 6 percent. They are a good way to diversify your investment portfolio and lower risk of loss. However, structured notes are best when bought and held to maturity. A financial advisor should be utilized when buying notes, as the terms can be a bit complex. In the U.S., an employee stock purchase plan is where employees of a corporation have the option to purchase stock or shares in the corporation, usually at a discount. Employees can contribute to the plan through payroll deductions, which build up between the offering date and purchase date. Employees also have the option to “cash out” their shares for immediate needs like, paying down debt, buying or renovating a home, building an emergency fund or reinvesting in a different retirement savings account. Buying a property, improving and/or developing it, and then turning around and selling it for a profit. It is possible for real estate investments to be profitable within the first few months of purchasing. Buying an older home in a good neighborhood and making a few minor updates can increase the value substantially, or “forced” appreciation. 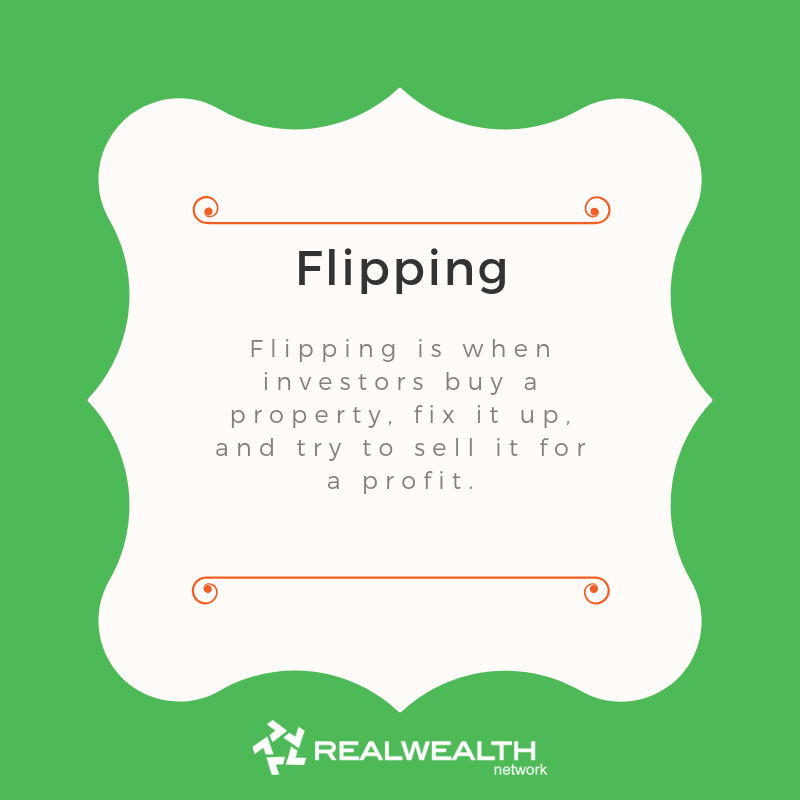 After “fixing up” or making improvements to the investment property, an investor can choose to either sell it for profit, also known as “flipping”, or it can be kept as a rental for monthly cash flow. While this is a very popular form of real estate investing, people often fall short on “flipping” because they do not understand the real costs involved. We will go into more detail on flipping below. Investor Tip: It is always a good idea to move your money to less risky, more stable investments like bonds and fixed-income funds, as you get closer to using it for its intended purpose. Most investing experts will encourage a long-term approach. “In every way that a short-term investment is risky, a long-term investment is secure. For every negative in a short-term method, a long-term option has benefits,” explains Fettke. The greatest asset in a long-term investment is time. The longer the investment, the lower the risk. The simple reason for this is inflation. Things get more expensive every year. More on that later. 401(k): many employers will offer a 401(k) plan where money can be taken straight from your paycheck and put into your retirement account. Employers also may offer to match your contributions, up to a certain percent. If you work for a company that does a 401(k) match, contribute at least what your company matches first. Why? This is essentially FREE money! Traditional or Roth IRA: Individual Retirement Account. Money put toward a Traditional IRA are tax-deductible and are taxed as ordinary income when the money is withdrawn in retirement. A Roth IRA is like a Traditional IRA, except contributions to this account are made after-tax and distributions during retirement are not taxed, nor is the money earned if your account grows over time. There are also retirement accounts specifically for individuals that are self-employed. Start your own company. This has the potential to be the most lucrative investment. However, there are many working parts, including some luck to start and maintain a successful business. Buy into a privately held company. This is called private equity investing, where an individual will invest in certain industry sectors, often based on their own knowledge and expertise. I.e. technology or engineering. Buy into a publicly traded business. This is done by purchasing common stock in a corporation on one of the stock exchanges or over-the-counter market. Most investors will participate in this kind of investment, where they are looking to learn how to invest their money made from other investment accounts. I.e. Money from broker accounts, mutual funds, etc. All types of money lending have been used for centuries in one form or another. The idea is that an investor lends his or her own money to a borrower, with the agreement the money will be repaid to the lender, over a specific time period, plus interest. The amount of interest, or interest rate is determined by perceived risk, projected inflation and the length of the loan. A privately negotiated direct loan with a borrower. Terms, conditions, interest rate and repayment time frame of the loan are agreed upon by the lender and borrower in a verbal or written agreement. Peer-to-Peer Lending (P2P). Typically done through online platforms, like: Prosper, Lending Club, Upstart, or Peerform. Investors will bid on a percentage of a loan and fund part of that loan. Government issued bonds. These bonds include, Treasury bonds, savings bonds, corporations, municipalities or nonprofits. Certificates of Deposit (CDs). This type of lending is where a bank or financial institution issues FDIC insured Certificates of Deposit. A bank will take an investors money for a determined period of time with the promise of repayment plus interest. As a CD is insured by the government, if a bank collapses, the investor will get their money back. Essentially, a CD means you are lending money to the bank to earn interest income. Index Funds. Index funds provide the best value with low fees. Index funds have securities that help spread risk, intended to keep pace with the overall market. For example, the S&P 500 is an index of the 500 largest companies in the U.S. and generally a good reflection of the overall health of the stock market. Historically, the average annual ROI on the S&P 500 has been 9.8%. This average ROI is 3-4 times higher than bonds and 10 times higher than savings accounts. Exchange-Traded Funds (ETFs). Similar to index funds, with low fees and securities to reduce risk. However, ETFs tend to vary more than index funds. Taxable Account: Or non-retirement accounts are more flexible in how much money may be contributed and no restriction or penalty for withdrawing funds. This type of account doesn’t have specific tax advantages. College Savings Accounts: These types of accounts also offer tax advantages. For example, a 529 account or a Coverdell education savings account. In our opinion, the best way to generate recurring monthly cash flow is by investing in the real estate market. Not only does investing in real estate produce monthly cash flow (assuming you did your research and bought in the right market), it also diversifies your overall investment portfolio. Buying an investment property and renting it to tenants. Make sure you’re up to being a landlord and if not, be prepared to hire a property management group and work that cost into your budget. 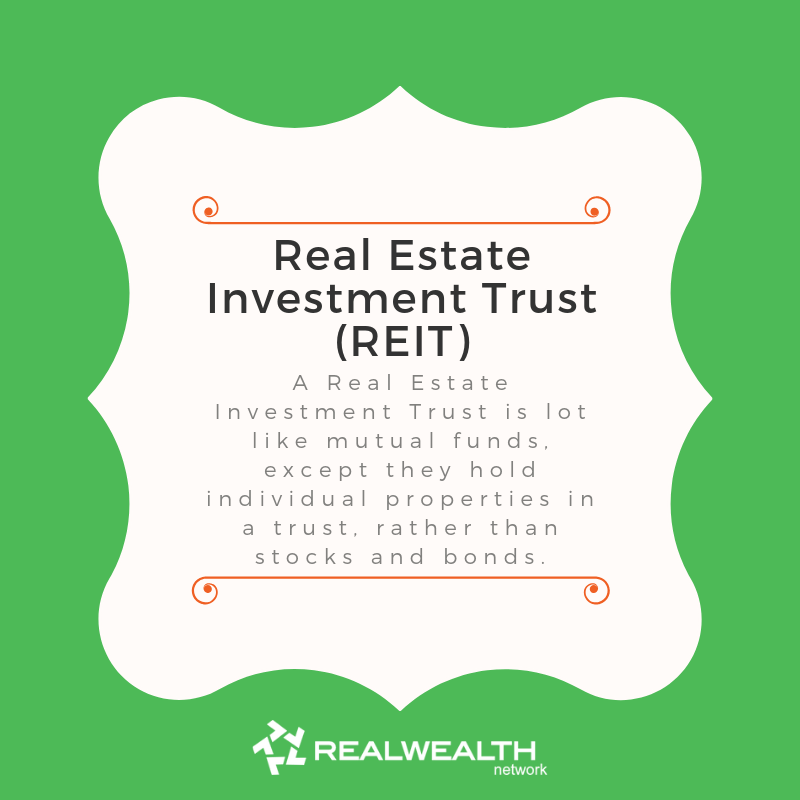 Investing in Real Estate Investment Trusts (REITs). Investors will pool their money together to buy real estate through a tax-advantaged business. Often, REITs will purchase a bigger real estate investment, like apartment complexes or multi-unit condos. This is a form of earning truly “passive” income because you are investing your money and the fund has a team in place to manage the properties. Something to note, is that very few investments pay you cash every month. For example, if you invested $100,000 in the stock market, did you receive cash dividends every month from that investment? Now, if you purchased a rental home for $100,000, you could be charging over $1,000 per month in gross rents. After property taxes, insurance, and management fees, investors should be pocketing around $700 per month in cash flow. In our opinion, this is the best way to invest for a long-term return. In real estate, these are two types of markets you will always be dealing with. A buyer’s market is one in which buyers have all the power. There are many homes on the market and not many buyer’s. As property owners have to compete with each other to sell a property, they may have to drop prices or offer some sort of benefit to buying from them. A seller’s market is just the opposite, where there are plenty of buyers, but not as many homes for sale. The seller’s, in this case, have all the power. As there are a limited number of homes for sale and so many people looking for a home, the seller won’t need to accept a low offer. They also may not need to make any improvements to the property, because they will likely find someone who is desperate to buy, despite of needed improvements. Markets will fluctuate up and down, and this is why a long-term strategy is best for riding out the storms. The best time to buy is in a buyer’s market. Sell in a seller’s market. It’s important to always pay attention to market cycles. The best markets to buy in are around major cities that are booming, with underpriced home values set to increase over time. Look for long-term growth and stability, not the next real estate bubble. We believe single-family homes are the best and most easily-managed real estate investments for passive income. Look for properties in good neighborhoods that high-quality renters want to live in. Compounding interest has shown that investors contributing even small amounts of money can grow exponentially over time to large amounts of money. Assuming you have diversified your investment portfolio in order to grow wealth through different assets and minimize your risk. It’s a common misconception that people think they can’t buy real estate until they are already rich. This is simply not true. In fact, your returns are much higher if you borrow money to buy an investment property. The idea is to use someone else’s money to supplement what you have in order to buy a home. 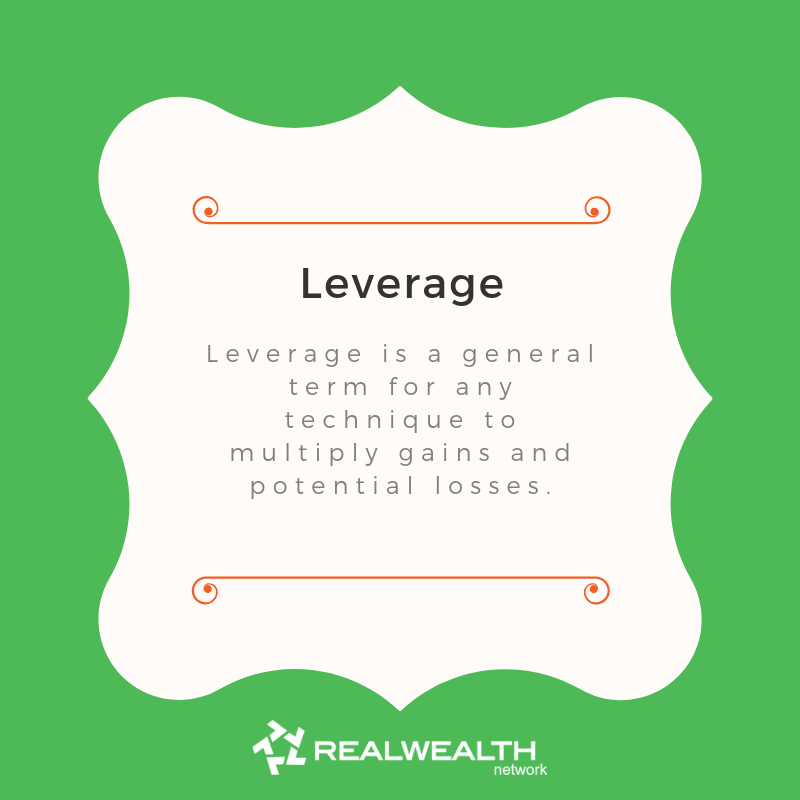 In finance, leverage (sometimes referred to as “gearing” in the UK and Australia) is a general term for any technique to multiply gains and potential losses. Most often it involves buying an asset using borrowed funds, with the belief that the income from the asset will be more than the cost of borrowing. The most common type of financing is in the form of fixed rate or adjustable rate loans. To learn more about different types of loans and what works best for you, check out my recent article here. Investors who buy and hold real estate for the long-term are building massive wealth. With the help of inflation eating away debt, while simultaneously increasing the value of assets, along with higher annual income from rising rents. The good news for real estate investors is that inflation mainly increases prices on items that people really need and want, like a place to live. Historically, home values have risen consistently with inflation and even exceeded it. In many areas of the country, homes will appreciate 1.5 times faster than the rate of inflation or more. Rents also increase with inflation. It’s like getting an automatic pay raise every year for doing nothing but collecting rents. Even better news for real estate investors is if they use financing. Imagine inflation eating up your cash and home equity. Now imagine inflation eating away your debt. The government wants to create inflation because it is a proven way to lower the value of its massive debt. If you bought an investment property and increased the value by fixing it up, it’s possible to access that equity and avoid paying the capital gains tax. Rather than selling, you could do a cash-out refinance to access your profits. Once you have your invested capital back, the cash flow produced by your property is essentially free money. The return on investment then just increases from there. Forced Appreciation is the process of buying a home and making improvements that increase the property value. The profit is considered forced appreciation because it took effort, not just timing of market cycles or inflation. However, not all improvements increase value of a property. If the investor chooses to hold and rent the property, it will produce monthly income for the life of the asset. There are also much more favorable tax deductions in buy-and-hold real estate. Selling the property may give the investor a lump sum of cash. However, if that money isn’t reinvested and treated as income, it’s not considered building a net worth. Additionally, the money earned from flipping is often taxed as ordinary income, which means you could be losing up to half to the government (depending on your tax bracket). One of the major reasons real estate is a top choice for investors is that it provides lasting wealth. If you really want to invest money to make money and build lasting wealth, keep your investment properties. Once you sell a house, you will never make any more money off of it. Keeping a property or multiple properties in your portfolio will continually produce more and more money every year, while the value appreciates. Looking to buy another investment property, but don’t have the cash to do so? Instead of selling the home to free up money for another investment, use the equity that has been built up and accessed through equity lines or refinances. This will give you the cash you need without selling the house. Did you know that you can self-direct your IRAs to invest in real estate without any penalties, if done correctly? Let’s say you bought a property for $100,000 and then later sold it for $200,000, under your IRA. All the profits made from the sale of the property would go directly back into your IRA, tax-deferred. The same concept can be applied to rental income. All the income generated by your rental property would go back into your IRA, tax-deferred. As mentioned above, a Roth IRA is a great tool for building lasting wealth. As always, it’s a good idea to utilize your CPA and self-directed IRA custodian to help follow all the restrictions and guidelines. -Paul and Cheryl Choate, San Jose, CA. 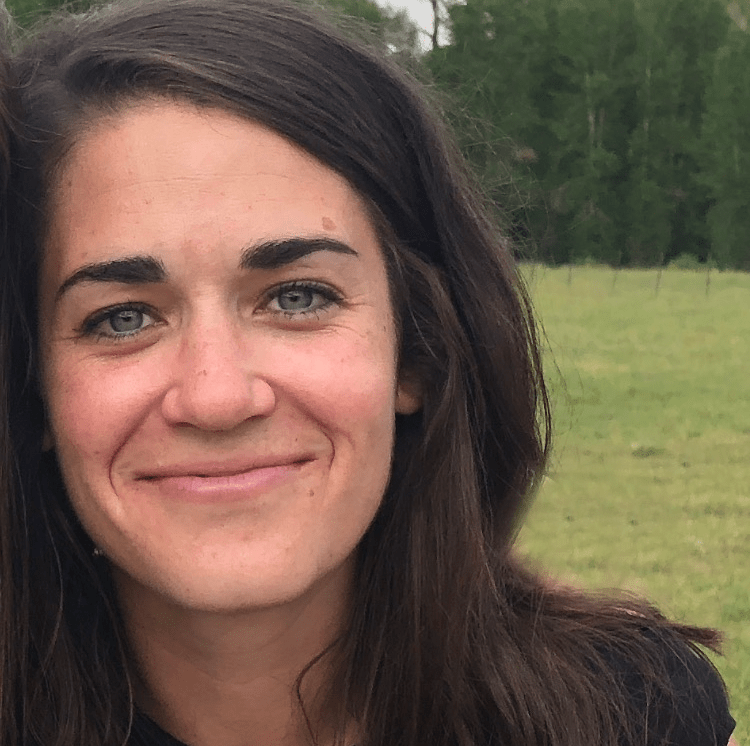 To check out more success stories like the Choate’s, visit the bottom of our home page or click here. Imagine waking up in 10 to 15 years and having an investment portfolio full of great rental properties, in desirable neighborhoods, that produce monthly income. Imagine the income your investments are producing have well-surpassed the income from your traditional day-job. Now you have the money and freedom to do whatever you want.